Oregano oil comes from the leaves of oregano plants, Origanum vulgare, which belong to the mint family. Oregano grows wild in Mediterranean regions, where it has long been valued for its healing properties. 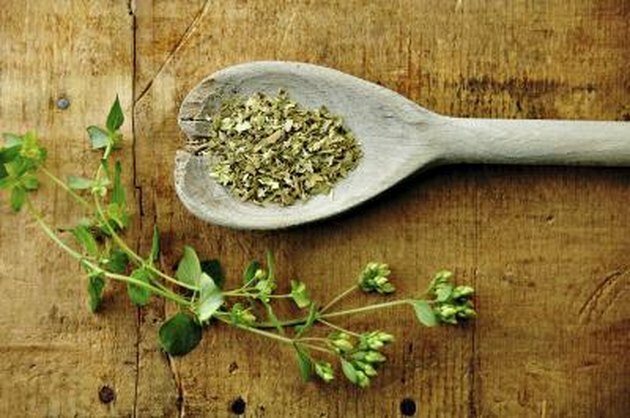 The word oregano means "joy of the mountains," and the ancient Greeks used this herb to treat headaches, indigestion, seizures and wounds. Today, oregano oil is valued for its antioxidant, antibacterial and anti-fungal properties. Check with your physician before using oil of oregano to treat specific health problems. According to "The Cure is in the Cupboard," a book written by Cass Ingram, M.D., oil of oregano is a powerful antioxidant, meaning it might destroy free radicals that cause cancer, strokes and heart disease. Oregano oil works as an antioxidant because of several potent compounds, including rosmarinic acid, hydroxycinnamic acid, p-hydroxyhydrocaffeic acid and labiatic acid. The American Cancer Society adds that the oregano herb contains about 30 times more antioxidant capacity than oranges and 42 times the antioxidant power of apples. According to Medical News Today, scientists at the University of West England in Bristol, England, discovered that oregano oil has stronger antibacterial properties than many prescription antibiotics. The report states that oil of oregano might even kill the powerful bacteria that causes the "superbug" called methicillin-resistant Staphylococcus aureus, or MRSA. Drugs.com adds that oregano oil effectively kills other bacteria, including E.coli, Salmonella, Proteus and the Helicobacter pylori bacterium thought to cause gastritis and peptic ulcers. Dr. Ingram claims that oregano oil offers such potent antibacterial properties because it contains thymol and carvacrol, two phenols that also act as powerful antiseptics. The thymol and carvacrol found in oregano oil also appear to have antifungal properties. According to Drugs.com, even small concentrations of oregano oil can inhibit the growth of the Aspergillus and the Penicillium fungi. Dr. Ingram adds that the two phenols also effectively kill the Candida albicans fungus, which causes various kinds of yeast infections. While Candida albicans naturally occurs in the human body, its growth can become excessive due to various factors, including antibiotic medications, a high sugar intake, chemotherapy and stress. To treat topical yeast infections, apply oregano oil directly to the infected site several times a day. To treat internal yeast infections, Dr. Cass Ingram recommends placing several drops of oregano oil underneath your tongue two or three times a day. Check with your medical practitioner before treating vaginal yeast infections with oregano oil. Dr. Cass Ingram reports that the carvacrol and thymol phenols can help kill various intestinal parasites, including tapeworm, pinworm, hookworm and roundworm. Drugs.com notes oregano oil's antispasmodic effects, stating that carvacrol and thymol seem to stabilize muscle membranes. Oregano oil also seems to have strong anti-inflammatory properties. The Wolfe Clinic suggests oil of oregano can help reduce the inflammation and pain caused by fibromyalgia and chronic fatigue syndrome (CFS). Dr. Ingram agrees, adding that oil of oregano can also help those with rheumatoid arthritis (RA). You can help reduce inflammation by directly rubbing oil of oregano on your affected joints or muscles.